Tablets represent the biggest shift in the computing industry in years, and represent a big threat to the traditional PC industry. 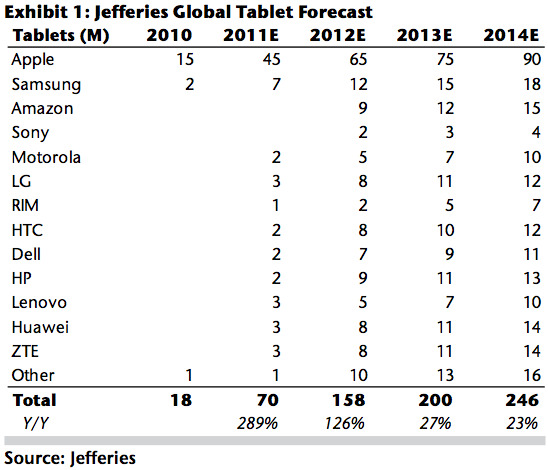 Jefferies analyst Peter Misek just published a comprehensive, 115-page report on the state of the tablet market, who’s going to win and lose, and what people are doing with their tablets so far. 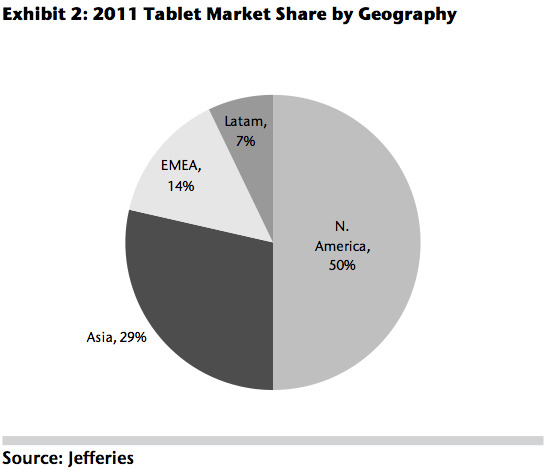 Big picture, the tablet industry is set to explode this year and next, becoming a worldwide phenomenon. He expects Appleand the iPad to be the biggest winner, but Samsung is looking like the strongest no. 2 right now. We’ve pulled out the best 15 charts from Misek’s report, which give a good picture of where tablets are right now and where they’re going. 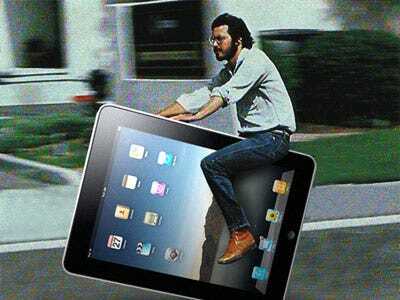 Tablet sales are set to explode this year, up 300% to 70 million tablets, with Apple leading the market. Android vendors are expected to catch up starting next year. 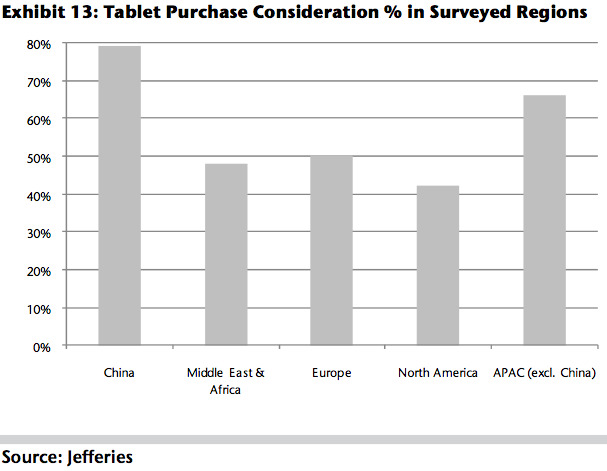 Half of tablets this year are going to be bought in North America, with Asia the second largest geography. That gives Apple an edge for now. Here’s what it costs to build a tablet, very roughly. You’ll notice that the screen is the biggest expense, representing about a third of the cost of the tablet. 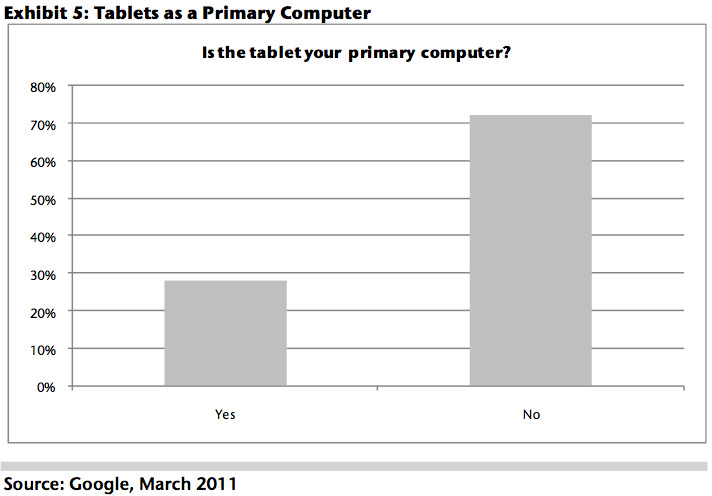 The tablet is already the primary computer for almost 30% of people surveyed by Google, surprisingly. 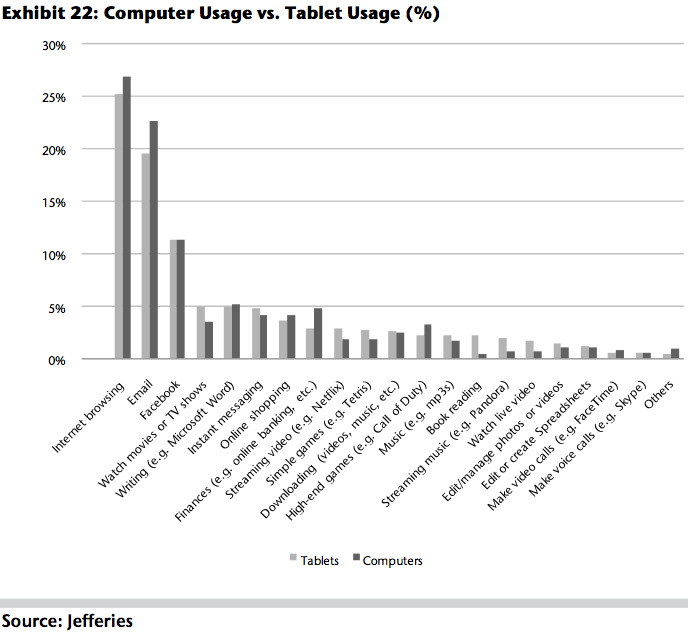 Tablets: Cooler than books and radio. Not as cool as phones or TV. 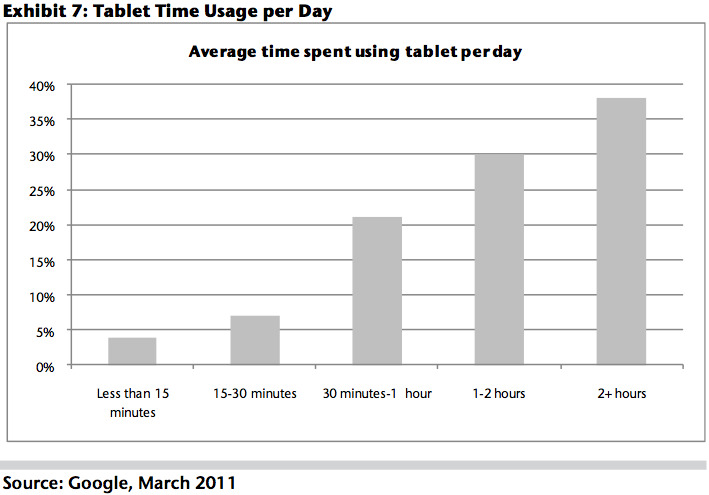 The biggest chunk of people spend 2+ hours a day using their tablets. More than half spent at least an hour per day. The tablet is primarily used at home so far. 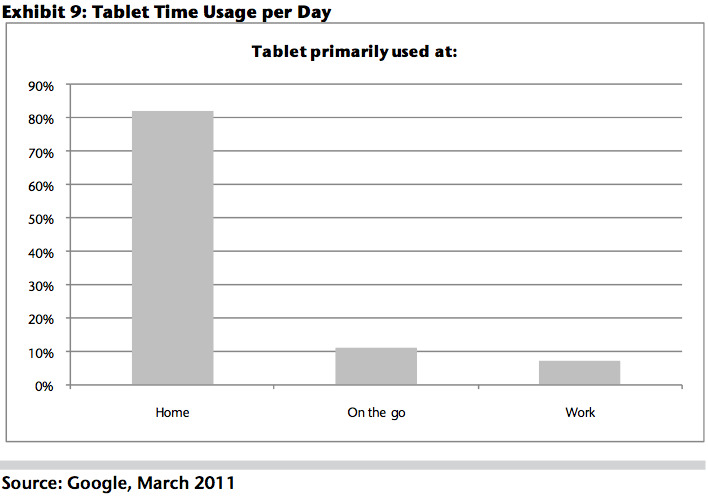 Maybe that will change if companies start buying tablets to use at work. 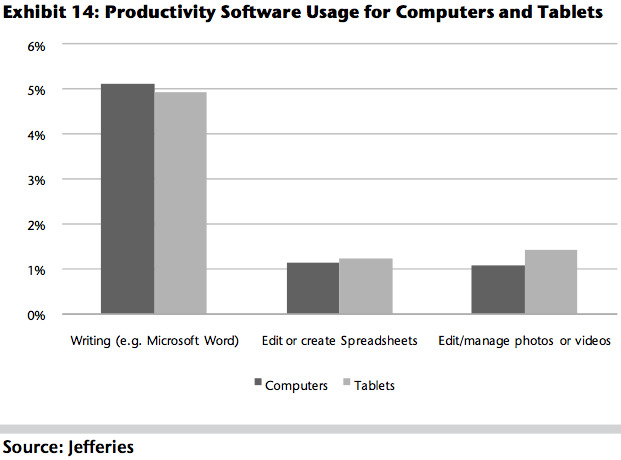 People don’t want to use Microsoft Word as muh on their tablet. But they do want to play with spreadsheets, and especially photos or videos. 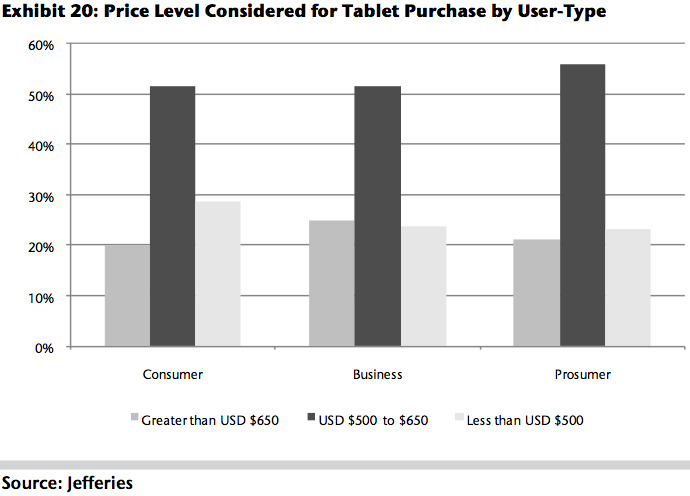 $500 is the sweet spot for tablets. Business buyers seem to be up for spending a little more than consumers. 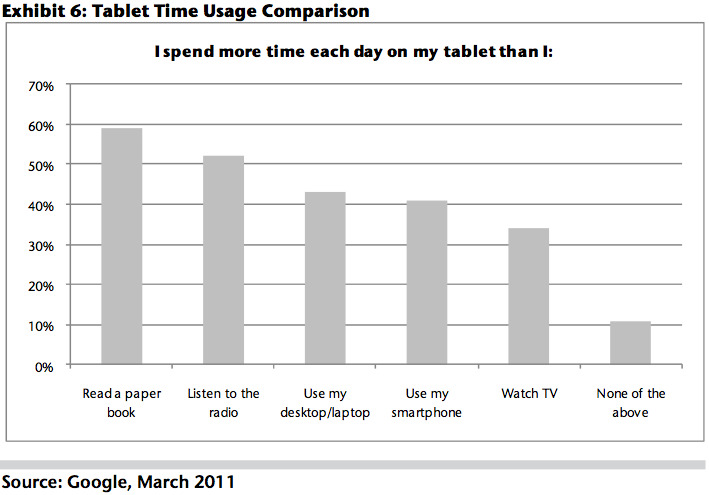 PC still beats tablet for web and email, but tablet wins for book reading, streaming music and video, casual gaming, etc.